America's Musical Life - Description | W. W. Norton & Company Ltd. When it comes to American music, America's Musical Life is "the best one-volume history yet on the subject for musicians and enthusiasts, professional or amateur" (Kirkus Reviews). 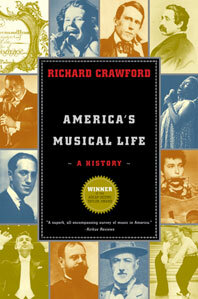 "Well-researched and sensitively constructed" (Library Journal) and "a book that welcomes the reader, who is happy to keep returning for more" (Music Library Association Notes), America's Musical Life tells the story of American music making in rich detail. In chronicling American music's bountiful heritage, this "superb book presents the whole sweep of U.S. cultivated and traditional music—from 16th-century Native American music through late 20th-century hiphop culture." A substantial cultural achievement, "this definitive history of music in the U.S. is sure to delight music aficionados and history buffs alike, and is a must for anyone interested in what music has meant to America and what America has meant to music" (Publishers Weekly). The life of a beloved American composer reflected through his music, writings, and letters. A 3-CD set edited by Richard Crawford containing historically appropriate performances of 70 works discussed in the book and supplied with Listening Guides.